A new Centers for Disease Control and Prevention (CDC) report states that over 100 million Americans are living with diabetes. Another 84 million are living with what is called pre-diabetes and are expected to develop full-blown type 2 diabetes within five years. Sadly, the trend shows that the number of Americans living with type 2 diabetes will continue to increase. Both insulin resistance and prediabetes occur when the body does not use insulin efficiently. Insulin is a hormone that is made by the pancreas. Its job is to help glucose enter into cells, muscles, fat, and the liver where it can be used for energy. We get this glucose from the food that we eat. In certain times, like during a fast, the pancreas makes glucose – also called blood sugar. After we eat, blood sugar levels rise, and the pancreas releases insulin into the blood. Insulin moderates blood sugar to keep it in a normal range. Insulin resistance: Think of insulin as the key that opens cell doors to allow glucose to enter in and provide energy. When glucose shows up on the scene, and insulin doesn’t open the door, glucose heads off into the bloodstream and hangs out. This results in elevated blood sugar. Because the body senses this, it responds by making more insulin. Again, insulin refuses to open the cell doors and blood sugar has no option but to stay in the blood again. This vicious cycle goes on and on as insulin levels in the blood rise. Prediabetes: People who are pre-diabetic have insulin levels that are higher than average but not high enough to be diagnosed with diabetes. Chronically high insulin levels cause rapid weight gain, high blood pressure, heart disease, increased cancer risk and premature aging. Eventually, this leads to type 2 diabetes. Both genetic, as well as lifestyle risk factors, contribute to the development of insulin resistance and prediabetes. For instance, if you live a sedentary life or are overweight, you are at a higher risk of developing insulin resistance. In addition, if you have a parent, brother or sister with diabetes, are 45 years or older or have a history of gestational diabetes or polycystic ovary syndrome, your risk is also increased. Also, people who have metabolic syndrome which includes a combination of high blood pressure, elevated cholesterol levels, and a large waist are predisposed to developing diabetes. While you can’t alter risk factors such as family history or age, you can change lifestyle risk factors such as what you eat, physical activity and weight. Research shows that the diabetes drug industry is massive and continues to grow. It is predicted that the industry will explode to $58.4 billion by the end of 2025. Yay! Food to the rescue. It is, after all, the best medicine. Let’s take a look at what science says about these common foods that can kick insulin resistance and diabetes to the curb… No drugs needed. You must love turmeric, with its powerhouse ingredient, curcumin. Research has uncovered all kinds of positive attributes of this rich spice including its ability to reduce inflammation, increase antioxidant power, boost brain function and effectively improve glucose uptake. Researchers found that curcumin beat the popular diabetes drug Metformin by being 500 – 100,000 more effective in helping the body use glucose. 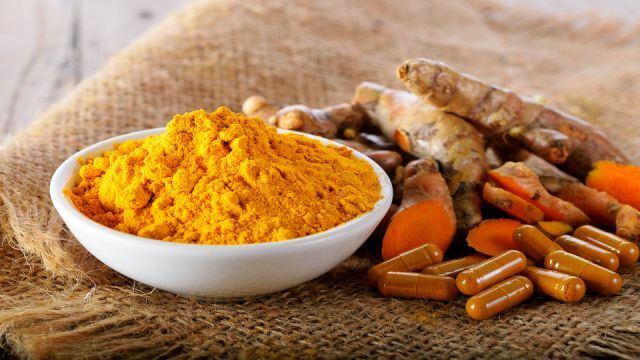 In another study, 240 people with prediabetes were given either 250 milligrams of curcumin daily or a placebo. At the end of the nine-month study, not one single person in the curcumin group developed diabetes – while 16.4% in the placebo group did. Ginger is not only a fabulous aromatic culinary spice, but this member of the turmeric family is also loaded with therapeutic properties. Researchers found that a daily dose of 1600mg of ginger was able to improve insulin sensitivity and eight other markers of diabetes. Get more ginger: Add fresh ginger to smoothies, soups, stews, and tea. Cinnamon is not only an ancient spice, but, it is also packed full of powerful health properties. Research has uncovered that cinnamon can regulate blood sugar levels in persons with type 2 diabetes by improving their insulin response. A review of eight studies found that fasting blood glucose levels were lowered with cinnamon and cinnamon extracts. It appears as though cinnamon works partly by slowing down the rate at which the stomach empties the contents of your last meal. This was discovered after one study gave participants a cup of rice pudding – half of the participants got their pudding with about a teaspoon of cinnamon on it and half got it without cinnamon. Researchers found that even less than ½ teaspoon of cinnamon a day reduced blood sugar levels in type 2 diabetics. Get more cinnamon: Add cinnamon to smoothies, coffee, oatmeal and use in baking. A random study compared the ability of spirulina and soy to control insulin levels. Seventeen participants received 19 grams of spirulina daily, and, 16 participants received 19 grams of soy. After 8 weeks insulin sensitivity was increased by 224.7% and the soy group increased insulin sensitivity by 60%. More good news for spirulina, 100% of the group improved insulin sensitivity while only 69% of the soy group improved. Get more spirulina: Spirulina in powder form is easy to add to water or juice or mixed in a smoothie. It is no secret that berries contain valuable health promoting properties including powerful antioxidants that can reduce oxidative stress and fiber that can help reduce total caloric consumption and help make weight management easier. Berries are loaded with vitamins and minerals. In fact, one cup of strawberries provides 150% of the recommended daily allowance for vitamin C.
It might seem contrary to think that something as sweet and delicious as berries could have a positive impact on blood sugar, but they do. Research has looked at the effect that berries have on blood sugar in helathy and diabetic people and found that they may protect cells from elevated blood sugar levels, improve insulin response and reduce blood sugar and insulin response to high carb meals. How to get more berries: Berries are so easy to eat and can be added to oatmeal, yogurt, smoothies, salads or enjoyed alone as a delicious snack or dessert. Next articleThe Great News About Eggs: Are They Finally Off The Hook? Hey Buddy!, I found this information for you: "Science Says: This Spice is 100% Effective at Preventing Diabetes". Here is the website link: https://www.thealternativedaily.com/science-spice-100-effective-preventing-diabetes/. Thank you.